Hello there ! 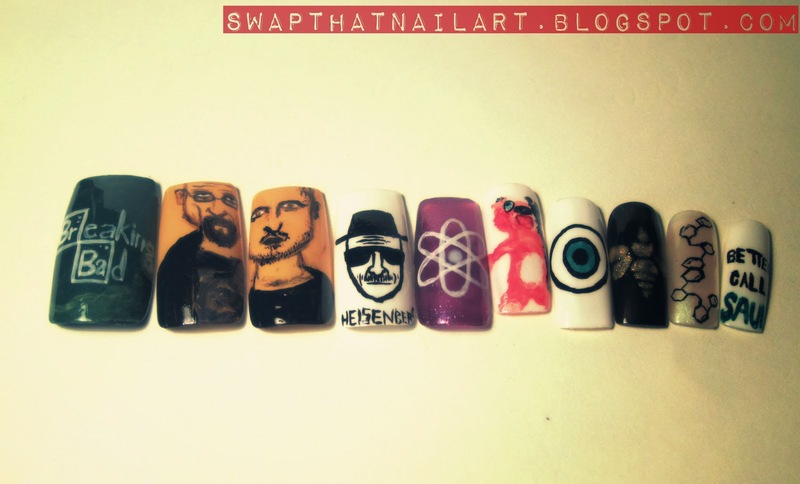 This time I had dedicated my nails to one of the best series ever- Breaking Bad. Everything is done using acrylic paint. 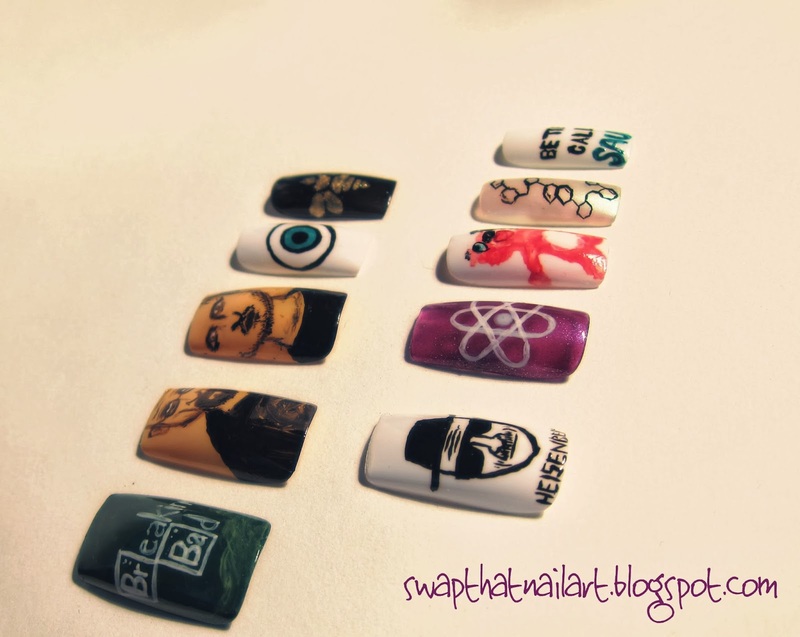 Jesse Pinkman took the most time; to his expressions right. I started watching the series last year, but stopped watching after first episode. Oh! Big Mistake. Again I started watching it in Novemebr and OMG! I can't believe I had put such an awesome series for hault. In one word this series is- FLAWLESS. Hats off to Walter White, Jesse Pinkman and all others who had acted in this series. For those who hadn't saw this series yet, I can make you familiar with the plot- Walter White, a high school chemistry teacher, family man who is diagnosed with lung cancer with short life expectancy. To secure his family's financial future, he begins 'cooking' meth with his former student, Jesse Pinkman. Next to that he has his brother-in-law, Hank Schrader, working for DEA, investigating and searching for ' Heisenberg'. You have to watch the series to follow his transformation from family man to a kingpin of the drug trade. 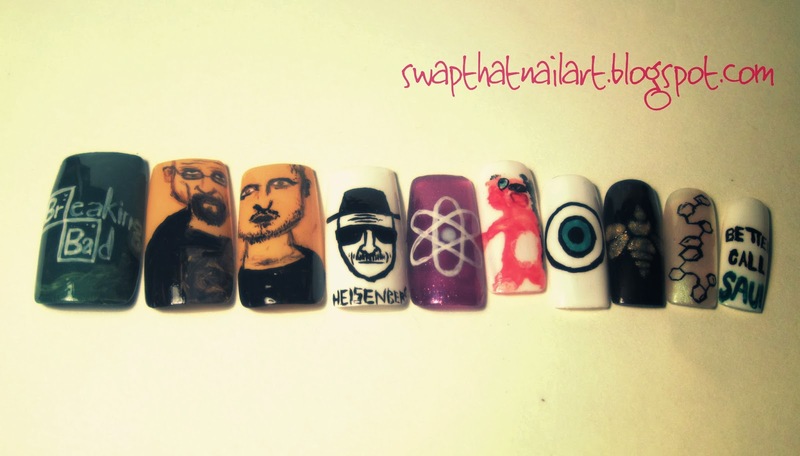 So dedicating these nails to Breaking bad, I painted synmol (Br)eaking (Ba)d, Walter White (his face-cut is not that perfect), Jesse Pinkman- took most effort, Heisenberg, Teddy Bear (without an eye); so I painted that eye on other nail to make it complete. The company's logo with Golden moth, which appears on a methyl-amine barrels in the series. 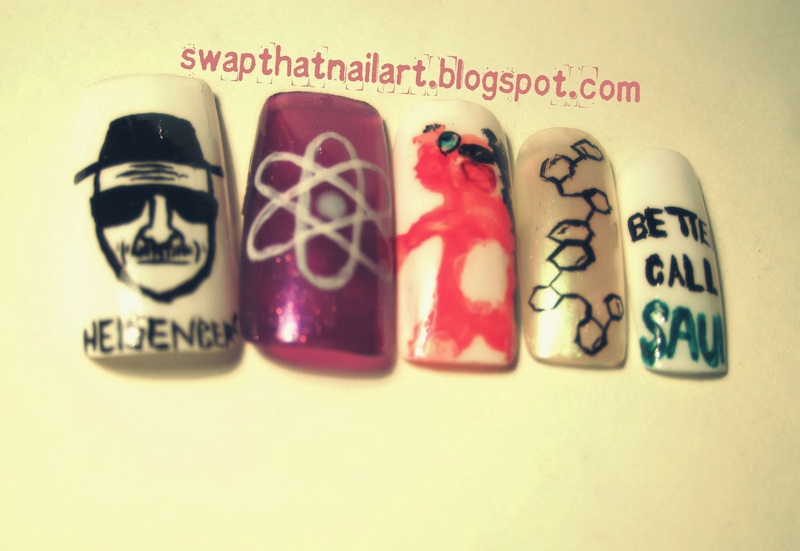 And a chemical formula for I don't know what :D & last but not the least Saul Goodman's slogan- 'Better Call Saul'. So if you want a kind of guy " who knows a guy who knows a guy" then you should 'Better Call Saul'. 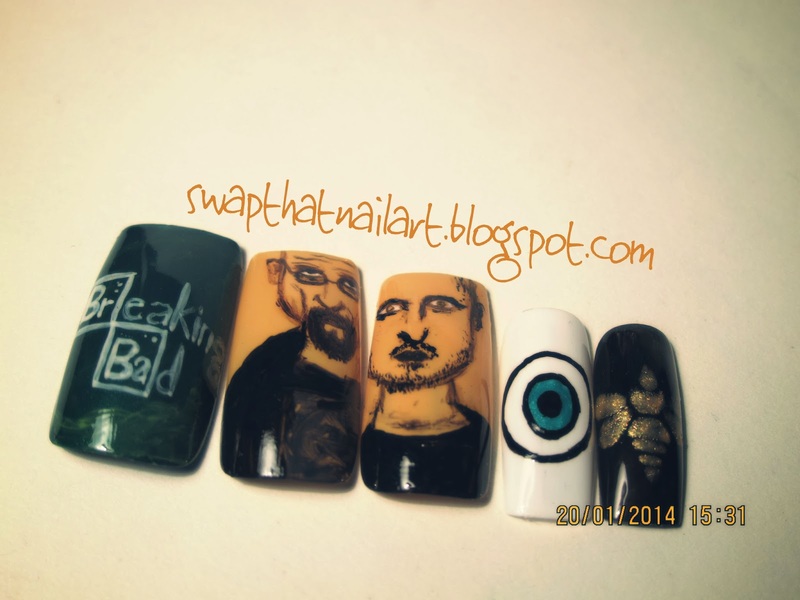 Please spare me for facial expressions and how Walter White & Jesse turned out!